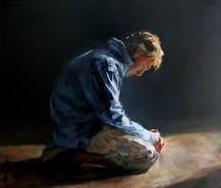 Elements and Characteristics of Confession …THE DOCTRINE OF REPENTANCE. Part 7. REMEMBER: If any one ingredient is left out, repentance loses its virtue. Sorrow is such a vehement passion—that it will have vent. It vents itself at the eyes by weeping, and at the tongue by confession. “The children of Israel stood and confessed their sins (Neh. 9:2). “I will go and return to my place, until they acknowledge their offence” (Hos. 5:15). This is a metaphor alluding to a mother who, when she is angry, goes away from the child and hides her face until the child acknowledges its fault and begs pardon. It must come as water out of a spring—freely. The confession of the wicked is extorted, like the confession of a man upon a rack. When a spark of God’s wrath flies into their conscience, or they are in fear of death—then they will fall to their confessions! Balaam, when he saw the angel’s naked sword, could say, “I have sinned!” (Num. 22:34). But true confession drops from the lips—as myrrh from the tree, or honey from the comb—freely. “I have sinned against heaven, and before you” (Luke 15:18). The prodigal charged himself with sin, before his father charged him with it. The heart must deeply resent it. A natural man’s confessions run through him as water through a pipe. They do not affect him at all. But true confession leaves heart-wounding impressions on a man. David’s soul was burdened in the confession of his sins: “as a heavy burden, they are too heavy for me” (Psalm 38:4). It is one thing to confess sin—and another thing to feel sin’s wounds. Our hearts must go along with our confessions. The hypocrite confesses sin—but loves it; like a thief who confesses to stolen goods—yet loves stealing. How many confess pride and covetousness with their lips—but roll them as honey under their tongue. Augustine said that before his conversion he confessed sin and begged power against it—but his heart whispered within him, “not yet, Lord”. He really did not want to leave his sin. A good Christian is more honest. His heart keeps pace with his tongue. He is convinced of the sins he confesses, and abhors the sins he is convinced of. A wicked man acknowledges he is a sinner in general. He confesses sin by wholesale. A wicked man says, “Lord, I have sinned”—but does not know what the sin is; whereas a true convert acknowledges his particular sins. As it is with a wounded man, who comes to the surgeon and shows him all his wounds—here I was cut in the head, there I was shot in the arm; so a mournful sinner confesses the various sins of his soul. Israel drew up a particular charge against themselves: “we have served Baal” (Judg. 10:10). The prophet recites the very sin which brought a curse with it: “Neither have we hearkened unto your servants the prophets, which spoke in your name” (Dan. 9:6). By a diligent inspection into our hearts, we may find some particular sin indulged—point to that sin with a repentant tear! He acknowledges the pollution of his nature. The sin of our nature is not only a privation of good—but an infusion of evil. It is like rust to iron or stain to scarlet. David acknowledges his birth-sin: “I was shaped in iniquity; and in sin did my mother conceive me” (Psalm 51:5). We are ready to charge many of our sins to Satan’s temptations—but this sin of our nature is wholly from ourselves; we cannot shift it off to Satan. We have a root within, which bears gall and wormwood (Deut. 29:18). Our nature is an abyss and seed of all sin, from whence come those evils which infest the world. It is this depravity of nature which poisons our holy things; it is this which brings on God’s judgments. Oh confess sin in the fountain! Those sins which are committed under the gospel horizon, are aggravated sins. Confess sins against knowledge, against grace, against vows, against experiences, against judgments. “The wrath of God came upon them and slew the fattest of them. For all this they sinned still” (Psalm 78:31-2). Those are killing aggravations, which enhance our sins. Should the Lord be severe in his providences and unsheath his bloody sword—yet we must acquit him and acknowledge he has done us no wrong. Nehemiah in his confessing of sin vindicates God’s righteousness: “Every time you punished us you were being just. We have sinned greatly, and you gave us only what we deserved” (Neh. 9:33). Mauritius the emperor, when he saw his wife slain before his eyes by Phocas, cried out, “Righteous are you, O Lord, in all your ways”. 8. We must confess our sins with a resolution not to commit them over again. Some run from the confessing of sin—to the committing of sin, like the Persians who have one day in the year when they kill serpents; and after that day allow them to swarm again. Likewise, many seem to kill their sins in their confessions, and afterwards let them grow as fast as ever. “Cease to do evil” (Isaiah 1:16). It is vain to confess, “We have done those things we ought not to have done”, and continue still in doing so. Pharaoh confessed he had sinned (Exod. 9:27)—but when the thunder ceased he fell to his sin again: “he sinned yet more, and hardened his heart” (Exod. 9:34). Now, when we have vomited up sin by confession—we must not return to this vomit! What king will pardon that man who, after he has confessed his treason, practices new treason? Thus we see how confession must be qualified. Meet the author and part of your Christian heritage: Thomas Watson (1620 – 1686) was an English, Nonconformist, Puritan preacher and author.